Yep, it's another of my cheapo eBay item reviews. This time I'll be reveiwing the MPU-100 Universal Quick Release L plate bracket. 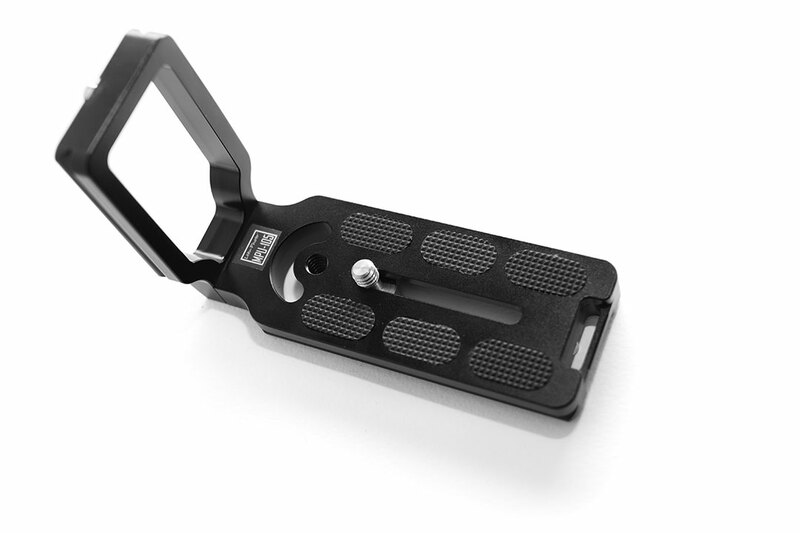 This item is an arca-swiss compatible L bracket, which is designed to be usable on a large range of cameras, rather than being designed for use with one specific camera. Update 2015-04-22: The version I bought was sold as an MPU-105 model, and indeed it has a sticker on it with the MPU-105 name. However, since originally writing this review, it has been brought to my attention that it is actually a mislabeled MPU-100 model. The MPU-105 has a different design, rather than one long slot that the screw attaching to the camera can slide along, the MPU-105 has 5 separate slots along the base. 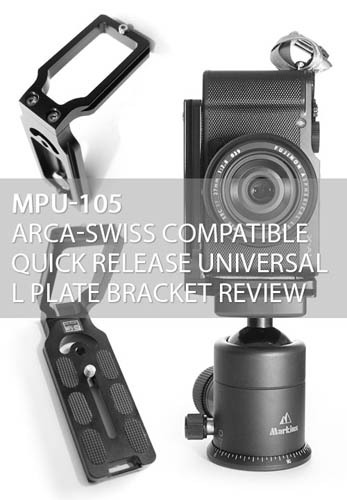 If I wanted to be really specific I guess I should say that this is a review of the MPU-100 Universal Quick Release L plate bracket that is labeled as being an MPU-105. Before I get into the review, I thought I'd just outline why I bought the L bracket. I've been wanting an L bracket for use with my camera for quite a while. 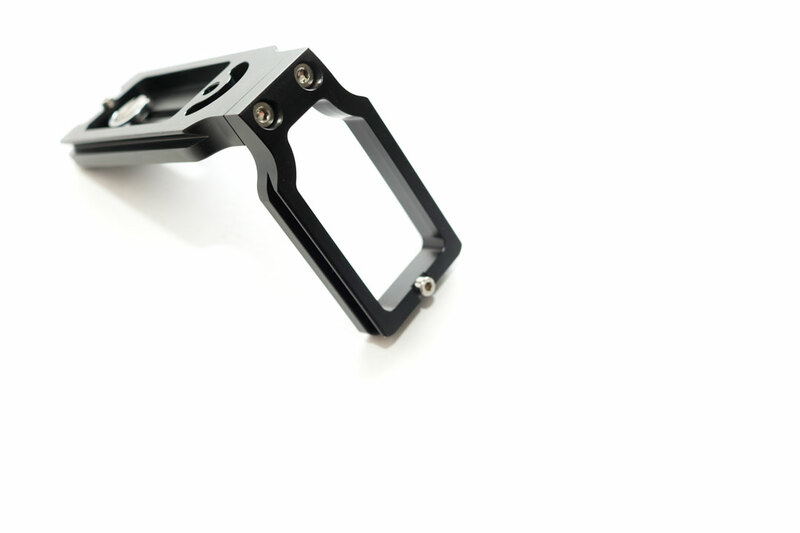 The benefit of the bracket is that it allows you to quickly and easily switch the camera from landscape to portrait orientation without having to adjust the tripod head. For my Vis-UV-IR flower photography I use a Manfrotto 410 geared head. The issue with this head is that if you use the left-right tilt control to tilt the camera to a portrait position, then controlling the head movements becomes much more tricky. It's as if you've lost one of the controls on the head. So an L bracket solves this problem. You always keep the head in landscape orientation, and just use the bracket to mount the camera in landscape or portrait as you want. I bought my bracket for £13.59 from eBay seller MagicDigitals and it took just over 3 weeks to arrive from Hong Kong or China. The bracket I received is actually slightly different from the images that were used in the eBay listing, but the differences are all pretty minor. The bracket shipped without any box or instructions. This is clearly stated in the eBay listing, so wasn't unexpected. On the actual bracket it has a small sticker that says 'Lettu Photo MPU-105'. It measures 11 cm long by 7.5 cm high by 4 cm wide. The section featuring arca-swiss compatible dovetail is around 8.5 cm long on the bottom plate, and 5.5 cm on the vertical plate. The bracket seems solidly constructed (from aluminium according to the eBay listing) and is reasonably light (91 grams). It is constructed from 2 parts, the vertical section is attached to the bottom plate by two screws. Likely the vertical section could be removed with the correct size allen key for undoing the screws. The two pieces are secured together well by the screws, and I can't feel any play between them. At either end of the bracket are small screws - one at the top of the vertical section, and the other on the end of the horizontal section. I believe these are designed to act as emergency stoppers. If you accidentally slightly loosen the plate so that it slips down in the clamp, the screw will catch on the edge of the clamp, preventing your camera from falling to the floor. However, this will only work if you've put the plate in the clamp / tilted the head so that the end of the plate with the protruding screw is at the higher end. It is also somewhat inconvenient when sliding the plate into the clamp, since you can only slide the plate in from the end that does not feature the protruding screw. These screws can be removed with an allen (hex) key though. On the bottom plate is a slot with a 1/4″ screw sticking through it. The screw can be moved along the slot, which is what makes this a Universal plate, suitable for use with various cameras. On the underside, the screw can be tightened via a standard flat head screw driver. A nice touch though, is that the screw has a D-ring attached to it, so you can get the screw pretty tight just by hand, with no extra tools needed. At the end of the plate is a small slot. I'm not sure what it's meant for, but you could thread a strap through there for carrying if you wanted. At the other end of the bottom plate, near the vertical section, are two holes. One is a 1/4″ threaded hole. This could be used for attaching the plate to a tripod head that uses a screw rather an arca-swiss clamp. Quite a sensible idea really. The other hole is curved in an arch shape and appears to have no use other than reducing the weight of the bracket by a few grams. It is not threaded. Along the edges of the plate are small textured rubber pads to help the camera grip the plate when screwed in. The vertical plate of the bracket is empty in the centre. As well as reducing the weight of the bracket, this may allow you access to sockets on the side of your camera. But this is quite dependent on your camera model. On my Canon 450D, if the bracket is mounted with the vertical side against the card memory door, then it will block access to the door. If you mount the bracket the other way round, and open up the side connections cover before mounting the bracket, then it will block the USB port but the video and shutter release sockets will still be accessible. With my Nikon D200 the bracket will block the memory card door if mounted with the vertical section against it. Mounted with the vertical section on the other side of the camera, it blocks the Video out and DC in ports, but allows access to the USB port. (So long as you have opened the USB port cover before attaching the L bracket). On the Canon 5D MkII it will block the card door if mounted against that side of the camera. 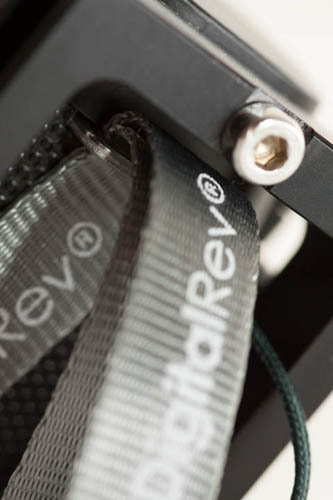 But mounted with the vertical section against the other side of the camera, all ports are accessible, so long as you open the socket covers before attaching the bracket. Mounted like this the battery compartment on the bottom is accessible too. So it works quite well with this camera. With the Fuji X-A1 / X-M1 (which is the camera I particularly bought this bracket for), one side of the camera has no sockets. So the bracket will mount against this side without issues, other than the battery / memory card socket on the bottom being blocked. But that is an issue with the majority of QR plates with this camera. With the vertical plate mounted against the other side of the camera, the HDMI and USB sockets can be accessed. Again, you would need to open the sockets cover before attaching the bracket. However, with the bracket mounted flush against the camera at this end, the bracket will be right up against the top control wheel of the camera. So not really usable in this configuration at all. Another thing that affects the usability of the universal L bracket is where the strap lugs are located on your camera. On my 5D2 the strap lug is higher than the top of the vertical plate. On my Fuji X-A1 / X-M1 the strap lug is lower than the top of the vertical plate. 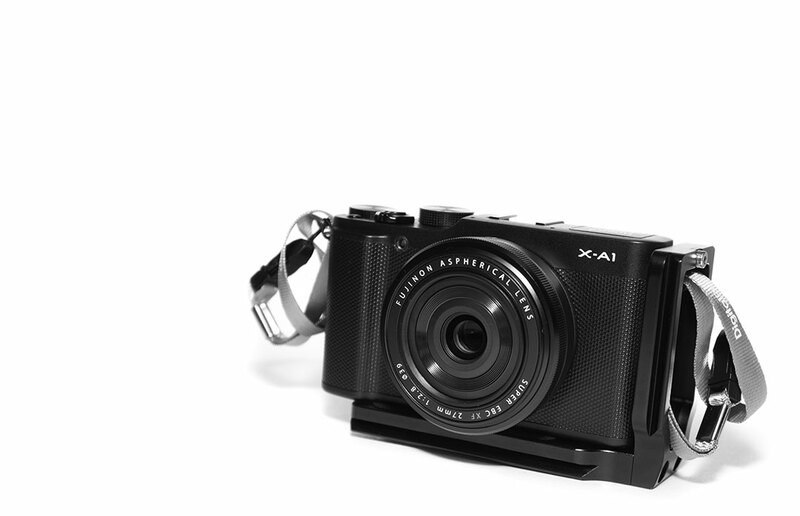 The top of the vertical plate comes close to the strap lug on my Fuji X-A1. (And I finally found a use for those little lanyard straps I've had for years - as tiny straps I can then connect my larger strap to). On both cameras there is a few millimetres gap between the lug and metal edge of the plate. This means that fabric straps will be fine, but straps with larger, inflexible metal attachments could be a problem. Similarly, if your camera's strap lug is at the same height as the metal edge of the vertical plate, this could be an issue. I think the 4 cm width of the bracket works well with a smallish camera like the Fuji X-A1 / X-M1. Most of my standard QR plates have a 5cm width, and so stick out a bit on this camera. The MPU-100 L bracket does still stick out at a little at the front of the camera, but not too much. It doesn't hinder flipping out the camera's screen at the back. Now, so far the bracket sounds pretty good. However, there is a big issue (with the particular one I received anyway). 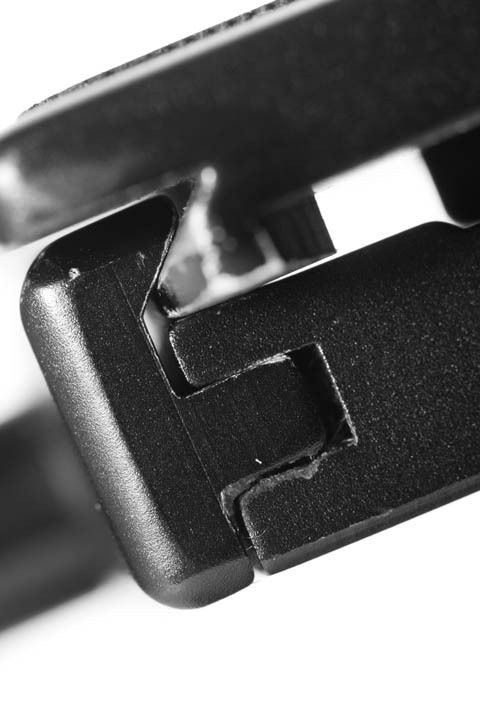 The width between the dovetails is less than that of other arca-swiss compatible quick release plates. Two of my clamps cannot close tight enough to grip the plate. You can see that the standard QR plate dovetails have a wider footprint, as well as being taller at the very edge. So the clamp can close tight enough to grip them with room to spare. The MPU-100 L bracket measures about 37 mm from dovetail edge to dovetail edge, while the standard plate measured about 38mm. 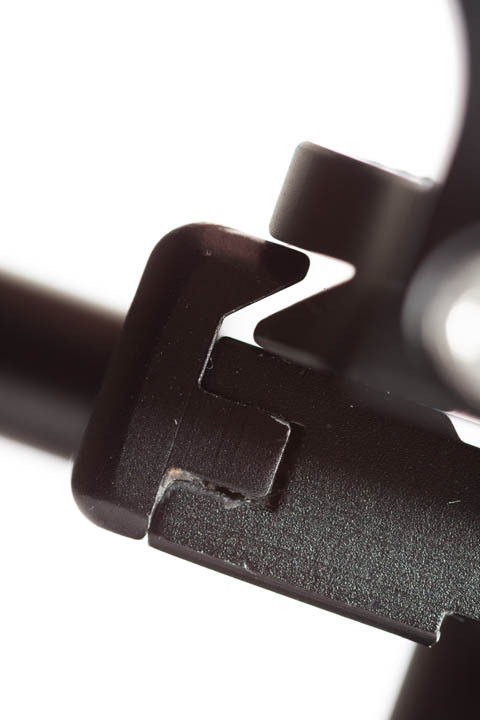 The L bracket dovetail edge is about 1mm high, while the standard plated measured about 1.5mm. Small differences but enough to make a big difference in use. Now, it isn't a total loss for me as my Kirk QR clamp and the clamp built into my Markins ball head both do close tight enough to grip the plate correctly. But it certainly makes the bracket less useful than I thought it would be. I did contact the seller about this, and they were very apologetic and issued me a partial refund. They also said We are sorry to hear this problem and we have sold many this item, but we seldom encountered this problem. Could it be that the problem is actually with my other clamps, not being able to close as tight as they should be able to? It seems unlikely to me that this would be the issue since I have quite a number of arca-swiss compatible QR plates that they work with. It seems more likely that the Kirk and Markins are over-engineered and can close tighter than should be needed. Possibly the bracket I received is faulty and it is not a design issue. Whatever the problem is, it is certainly something you should be aware of if you are considering purchasing this bracket. So to conclude, the issue with it being too small for some of my clamps almost ruins this bracket for me. A shame, as other than that it seems like a well made and thought out design. Update 2015-12-16: Thanks to René Lesseux who let me know that the bracket he received was 39 mm in width, and so has no problem being clamped securely. It sounds like the narrow width of my bracket was a (temporary) manufacturing defect rather than a product design defect. René has also kindly sent me information on a custom lightweight and low cost panorama bracket he constructed that works well with this bracket. I hope to publish this information shortly. I should also mention that if you do get a thin bracket like mine, you can always fatten it up by supergluing a strip of card to each of the dovetails. I've done this on mine and it now fits securely in the clamps it previously was loose in. Update 2015-12-19: I've now published René's panorama head design that makes use of this bracket: Low cost, size, and weight panorama head / plate.